Original image source could not be found. The original image used to create this header was uploaded to hundreds of wallpaper sites. 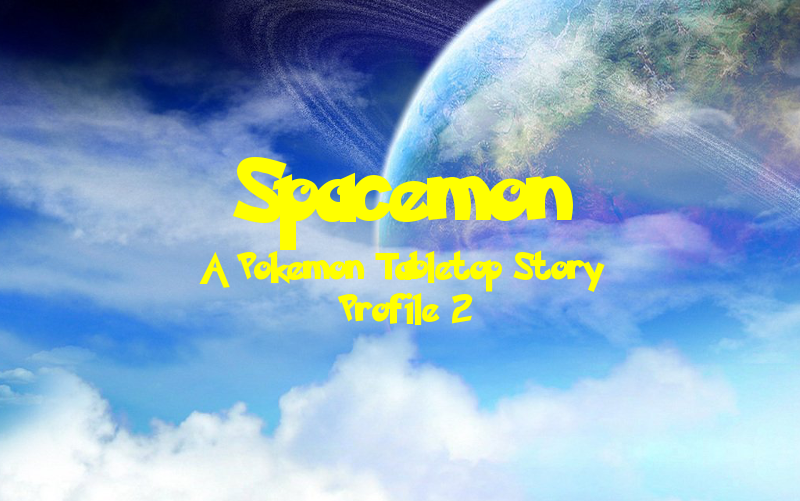 Welcome to another exciting installment of Spacemon, the tale of a Pokemon TRPG campaign! This is the second entry in a multi-part anthology series where each entry follows a different character in the Spacemon universe. You can get caught up on our previous adventures here! Gilgamesh sat cross-legged on the floor in the center of his meditation sphere, watching the small Genevan bucket through the tiny viewport. The aging Sinai monk found the vessel’s crew to be quite interesting, despite having only conversed with them briefly. There was just something about them, something that drew him to them. Perhaps it was the fact that they had risked their own lives to help the Federation when they had no obligation to do so. Perhaps it was the fact that they were in search of knowledge. Perhaps it was the fact they were planning to bravely fly off into the unknown. Gilgamesh could not say for sure, no, but the one thing he did know was that the Warp had brought him here for a reason, that it had brought them here. The old monk knew that he had to help them. He had spent a great deal of his life studying the Warp, learning from it, and he had passed along a sliver of his knowledge onto them. Gilgamesh suspected that what he had learned of the Warp’s true nature would help them find their way back once their journey into the unknown was complete. “The Warp is a curious enigma,” Gilgamesh said, gazing around at the circle of monks intently drinking in his words. “It is a realm that is separate from our own, and yet it is through the Warp that all things are connected.” As he concluded his thought, the monk took a moment to breathe and allow the others to interpret his words and discuss amongst themselves. As one of the older monks began speaking, Gilgamesh allowed his gaze to wander across the skyline of Mechorah. Although the sun had shone on the rooftop gardens of the Grand Monastery for an hour now, it had yet to fully reach the city below. The ancient temple on the other side of the city cast a looming shadow, shielding everything between the two monuments from the dawn. His people had discovered those ruins about six centuries ago when they first landed on this world; it was from the temple that they uncovered the secrets of warp travel to connect the Galaxy. Gilgamesh returned his attention to the garden. The circle was looking at him expectantly, waiting from him to weigh in on the discussion. The monk had more than grown used to it by now. Ever since he had returned from his pilgrimage, his fellow monks had flocked from all across Sinai space to hear him speak, to hear him share the secrets of the Warp that he had learned. Today’s conclave was no different; both the fresh young minds who had yet to go on their pilgrimages, and the wise elders whom had been at this since before his own time all held his opinion in high regard. “What do you mean?” the young man asked. Gilgamesh stood at the edge of the garden, gazing out upon the buildings. The midday sun now shone down upon the spires of Mechorah’s capital city, whose metallic surfaces reflected its rays in various directions. The conclave had adjourned and the garden was now quiet save for the sound of the light breeze rustling through its bushes. “I am honored,” Gilgamesh told the old man, bowing his head in respect. Azriel was the most senior member of the Archival Council and was highly respected by his fellow monks in the Congregate; to receive such high praise from the man was, indeed, a true honor. Gilgamesh raised an eyebrow inquisitively as he turned his head to face Azriel. “What are you suggesting?” he asked the old man. “Hmm.” Gilgamesh stroked his short, dark beard as he thought it over. As much as he loved to spend time with the students training in the Grand Monastery, teaching them what he knew, the monk realized that he had more yet to learn for himself, more knowledge to be gleaned that he could pass on. “Perhaps you are right,” Gilgamesh agreed. The desert sun hung low on the horizon, its warm orange glow casting long shadows along the ground as it fell upon the ruins scattered across the sands. Despite the waning daylight, the sun was still blistering. Luckily, in the shade cast by the large rocky outcroppings surrounding Gilgamesh, it was quite cool. The monk was grateful for the shade, but that was not the reason he had chosen to land his meditation sphere at this particular location. Here, between the eroded rock formations, once stood a great temple, for what purpose Gilgamesh was only beginning to glean. Amongst the ruins, the monk felt a strong, lingering aura, as had been the case with the other planets he had visited on his pilgrimage. For the past few years, Gilgamesh had been traveling across Sinai space and the surrounding sectors, even going as far as the very fringes of the Outer Rim, the edge of explored space. In that time, he had visited ruins on countless worlds, some of which were sites that had never been documented until now. Gilgamesh breathed in, pondering his journey as he sat cross-legged at at the heart of the ruined temple. He had felt fluctuations in the Warp at the other locations he had visited, each one leading him to the next. These temples, all in varying degrees of ruin, seemed to be connected somehow. The monk had determined that there had once stood another great civilization, one that the Sinai texts did not speak of. The notion wasn’t entirely unprecedented; Sinai religion had been built up through centuries of monks exploring the Galaxy on their pilgrimages after all. However, something about these temples was unsettling. This site in particular felt different than the others. While the other temples seemed to have decayed through millennia of abandonment, this one appeared to have been destroyed before it was reclaimed by nature. Gilgamesh breathed out, then opened his eyes to gaze upon the desolate landscape, dotted with occasional remnants of civilization. It was not just centuries of erosion as a result of the hostile climate of this world that had caused this destruction. No, this temple and the surrounding city had been ravaged by something else. As the monk drew his conclusion, he was suddenly struck by a rush of images. The vision poured into Gilgamesh as his mind tapped into the temple’s residual psionic energies. The temple stood whole, the large pyramidal structure towering above all else as a testament to the people’s devotion. Out from this world, a great empire flourished as it spread its faith across the stars in the name of its gods. The gods descended from the heavens, but the people were rewarded not with salvation, but destruction. The gods turned the people against one another, driving civilization into violence and chaos. Out from this world, a great empire collapsed as it spread war across the stars in the name of its gods. The gods ascended to the heavens, the people having wrought their own destruction. Gilgamesh opened his eyes, overcome with horror as he tried to make sense of what he had seen. The monk gazed across the horizon, once more taking in the view of scattered ruins as he calmed his mind. He glanced down at the holoscroll sitting in the sand in front of him. The brilliant glow emanating from it began to fade, but instead of returning to its inert state, it dulled to a pale purple; with this final vision of destruction, it was now complete. Scroll in hand, Gilgamesh rose to his feet with a sense of urgency. Things were not as they should have been. His pilgrimage now over, it was time to return to Mechorah. The monk hastened to his meditation sphere. The Congregate needed to be warned. Deep within the heart of the Grand Monastery, Gilgamesh sat waiting. For days now the Archival Council had been sequestered away inside the Grand Archives, reviewing the holoscroll his second pilgrimage had produced. Gilgamesh had barely moved a muscle since he had submitted it to the Council; deep in meditation just outside the Archives, the monk subsisted upon nothing more than the energies of the Universe itself. Few had mastered this advanced form of meditation, and Gilgamesh made it seem an art. A decade traveling the Warp on his first pilgrimage had honed the man’s mind and body. He had often spent weeks, even months without eating. The few days spent waiting for the Council to review his scroll were inconsequential by comparison. Time itself was almost inconsequential to Gilgamesh in this state. The physical world seemed to have faded away, leaving him with just his thoughts. So focused was he that he did not hear the doors to the Grand Archives open, nor the apprentice archivist calling his name. It was not until the young woman placed a hand on Gilgamesh’s shoulder that he became aware of himself again. “It is time then,” Gilgamesh stated. The young woman nodded and gave the monk a slight smile as she beckoned him to follow. Gilgamesh stood up from his seat, and followed the younger monk through the doors into the Grand Archives. The two descended a small flight of stairs into the central atrium where many monks milled about; some sat in meditation, others wandered about collecting the unique components for their scrolls amongst the pieces laid out on the shelves as they were directed by their instincts. Gilgamesh cast his gaze upward, past the monks browsing the holoscroll archives on the upper floors that reached all the way to the top of the Grand Monastery, to the massive psionic crystal hanging high above the center of the atrium. The large pink object served as a central nexus for the library, channeling the psionic wisdom of the scrolls stored within the vaults for consolidation. It radiated an aura of knowledge, standing as a symbol of unity around a universal truth. As they neared the far side of the atrium, Gilgamesh returned his eyes to what lay ahead of him. Reaching the end, the apprentice bowed and motioned for the monk toward the stairs before she departed. Slowly, Gilgamesh ascended up to the raised area where the Archival Council sat waiting in a circle around the small pedestal in the center upon which sat his holoscroll. Gilgamesh took his seat, facing the nine members of the Council gazing at him with stoic expressions. They were normally very serious when they assessed a scroll, but they seemed more so now than ever. Given the grim revelations contained within his scroll, Gilgamesh was not surprised. Gilgamesh eyed the ring on his finger: a band of simple metal signifying his honored ranking in the order. In the center was set a tiny crystal hewn from the same stone as the one above them. He turned it in his hand, weighing the decision before him. Gilgamesh turned his back to the Council, cast his ring at the stone floor, and walked away. He crossed the atrium and exited the Grand Archives, never to return again. The lights within Gilgamesh’s meditation sphere flickered to life as the old monk stepped aboard. Like most of the technology built into the Sinai vessel, he was able to activate them with a mere thought. Gilgamesh strode across the sphere’s single room toward the healing machine and placed his Pokeballs inside it. Once they were secured in their slots, the old monk reached for the switch to turn it on. Not every piece of technology in the sphere could be controlled by thought, of course. As Gilgamesh watched the machine do its work, a slight smirk appeared on his face, although it was hard to tell due to his long, flowing beard. It had been a long time since he had experienced a battle quite like that one. As an Outer Rim gym leader, the old monk was used to being stronger than the majority of his challengers. Today’s opponent had not been one of them. Today, Gilgamesh had been defeated for the first time in a long time and, although he had lost, he couldn’t help but feel satisfied. The young man Gilgamesh had faced had displayed masterful command of his Pokemon, who had gone toe-to-toe with each of the monk’s own. Down to the last Pokemon, they each had battled and, even at the disadvantage of being left with a Nidoking at the end to face Gilgamesh’s Malamar, the trainer had emerged victorious. That Nidoking had been fierce and well-trained; Gilgamesh rarely saw such a fine Pokemon. The machine beeped, pulling Gilgamesh out of his thoughts. The monk shut the machine off, then retrieved his Pokeballs, placing them gently back into the pockets of his robes. His Pokemon now healed, Gilgamesh sat himself down in the center of the sphere to meditate. It had been many years since Gilgamesh had turned his back on the Congregate. In that time, the monk had traveled the stars far and wide, learning all he could from the Universe. Without the support of the Congregate, Gilgamesh had become a gym leader in order to sustain himself. The funding he received was more than enough to pay for food and basic supplies, so, despite no longer believing in the institution of the Congregate, he donated many of his credits there. While he did not agree with its doctrine, is was still the primary body in Sinai space responsible for providing charity for the poor. Being a gym leader also offered Gilgamesh freedom to explore the Galaxy that he did not have as a teacher to the young Sinai monks; it was a freedom that he made good use of. When he wasn’t battling against challengers, Gilgamesh was searching for answers. Since leaving the Congregate, the monk had been trying to do what the Congregate would not: heed the warning of his vision and unlock the truth behind it. Gilgamesh had seen and learned much. The Galaxy was teeming with life, but it was not some happy accident, nor divine providence. Worlds had been sown with the seeds of Life and Knowledge that had borne the fruits of Pokemon and Humankind for some other purpose. Gilgamesh had found references to a great Gardener of Eden whom had tended the garden worlds of the Galaxy, allowing life to flourish and spread to the stars, but a dark implication lurked behind that notion. If his visions of destruction suggested anything at all, it was that someone or something had set life on a course that would eventually lead to its extinction. Gilgamesh knew he was still missing something. If only he could speak with this Gardener… He focused, and the meditation sphere began to float upward. The small vessel ascended into the sky. Gilgamesh needed to find the answers he lacked. Gilgamesh opened his eyes. Reflecting upon his travels, the old monk had lost sense of time. The small bucket had long since departed. The damaged Federation cruisers had been evacuated, and a whole fleet had arrived to secure the area. It was apparent that he would not be leaving this sector any time soon, but Gilgamesh didn’t mind. It would give him time to think. The old monk was closer now to finding the truth than ever. However, the closer he got, the more he began to doubt himself. Did he really want to learn the truth? Deep inside, Gilgamesh knew he had to find the answers. That was why he had traded for information on the Gardener, was it not? He had given the location of an ancient artifact of untold power, one that he had come across in his many travels, to an information broker of sorts. Gilgamesh knew not what the mysterious man wanted the artifact for, but the monk knew that if anyone could find the Gardener, it was Mr. Silver. Gilgamesh looked back out at the warp gate once more. The crew of that small Genevan ship were searching for answers of their own. Seeing how they had bravely dove into the unknown in that search had inspired something in Gilgamesh. Perhaps, he wondered, he should follow their example. Author’s Notes: At long last, it is done! I began work on this piece shortly after Profile 1, which I posted back in late June! This was just a really difficult piece to write since it relied on a lot of plot details I wasn’t too clear on and covered so many aspects of the lore that had yet to be explored. I’m sure DragonStorm got sick of me pestering him with messages asking questions. I also just had a lot of difficulty with how to write certain scenes and just motivating myself to work on it. Taking a break to focus on Blueshift certainly helped. When I came back to work on this piece I felt refreshed and ready to tackle it. One thing before I dive in though: This piece is placed in the reading order in the middle of Volume 1, so for those of you who’ve read everything try to avoid major spoilers in the comments because there are a lot of subtle hints to future events in here. Gilgamesh is one of the most interesting characters in Spacemon, and also one of the oldest. Given that, most of his interesting bits are in the past, so I presented this as a frame narrative, one that takes places just after his first meeting with the crew, between Chapter 11 and Chapter 12 of Volume 1. After meeting them, he reflects back on his own journey and how that brought him to where he is at this current point in the timeline. So now we go way back to the past to get our first solid glimpse of Sinai culture. The first couple of scenes, ignoring the opening of course, is way back, 25 years prior to Volume 1. The only human member of the party who had been born at that point was Arlon, and he was only 3 years old! Here we can see Gilgamesh, somewhere in his 40s, already a wise and respected monk amongst his peers. I also got to tease what waits in the next chapter of Volume 1! So pilgrimages are a huge thing in Sinai religion, but the funny thing is it was a minor plot detail I came up with in the second origin story, which you won’t read for a while if you’re following reading order, but since then DragonStorm and I fleshed out the concept. As a rite of passage, a Sinai monk must go on a pilgrimage to create a holoscroll, which is another completely random concept that came up once as a minor detail in Volume 2. Monks travel to various locations and record their psionic visions, and this is how Sinai religion expands. Some monks who are greatly wise, such as Gilgamesh, even go on multiple pilgrimages. That’s all I can say for now, but we will learn much more about holoscrolls and pilgrimages in a future Profile! Moving on to the next scene, I don’t want to say too much because spoilers, but I have to say, Gilgamesh’s vision is like my favorite paragraph I’ve ever written for Spacemon. It is so good in so many ways. So this scene and the next are set about four years after the previous one, at the end of Gilgamesh’s second pilgrimage. Here he finds a dark truth that the Congregate, basically the Sinai equivalent of the Vatican, rejects because it doesn’t fit nicely into their Bible. This sets Gilgamesh on the path we see him on in the rest of the series! The last scene, excluding the present-day final scene, is set about 5 years before the start of the campaign, just to set up some important things Gilgamesh has been doing since leaving the Congregate, but I couldn’t resist throwing in a little nod to that random trainer we fought on Otho, who may or may not appear later on! It was a fun little thing. In terms of writing style, I decided to try something a bit different than what I did for Hondo’s profile. That one was focused more internally, showing Hondo’s thoughts and excitement at the prospect of wealth, whereas this piece focused heavily on descriptions, like we’re on the outside looking in. I also was very particular when it came to word choice and sentence structure. There are certain moments, such as Gilgamesh’s vision, that are almost poetic in a sense. It was a fun experiment and I look forward to trying out different writing styles for future Profiles to find the ones that are best suited to each character. I hope you enjoyed reading this Profile as much as I enjoyed completing it! I can’t say I enjoyed writing it because it was very draining, but I am so happy it’s done and that it turned out better than I could have possibly imagined. Super special thanks to DragonStorm247 for helping me write this! There’s a few details he’s added in here that even I don’t understand yet.